• The Baileys Harbor Town Clerk’s Office will be closed through Nov 29. Those who need assistance can call Town Supervisor Barbara Anschutz at 920.493. • The new pavilion and concession stand for the Sister Bay baseball field is near completion. Located at the Sister Bay Sports Complex, the pavilion will provide shelter for events and be used for Door County League Baseball games. In honor of those that came before us, the Thanksgiving holiday asks that we stop and remember where we have been and those that helped us get here. I moved to northern Ellison Bay in September of 1995, arriving just in time for fall. Wisconsin offers several programs to assist people in times of financial distress. Here are just a few programs and the local contact for assistance. You can also find out if you’re eligible for a variety of government assistance programs at www. Job losses, reduced hours and benefits, and other effects of the recession have created unprecedented demand for the Wisconsin Home Energy Assistance Program (WHEAP), also known as Wisconsin Home Energy Plus. Unemployment in Door County is at the highest level in over 20 years, and Melissa Emery of the Door County Job Center wants people to know that there are programs to help Door County residents get through tough financial times. Preliminary room tax returns for September showed a 3.2 percent increase in comparable municipalities from the same month in 2008. Occupancy rates for September showed a dramatic jump from 40. It’s never been easy to sell Door County in winter, but if the beaming faces and air of pride that washed out of the Door Community Auditorium Saturday night are any indication, there are about 1,500 people with a new round of ammunition. The embattled Egg Harbor Marina reconstruction and expansion project is in rough waters yet again. The Peninsula Shores Condo Association has filed for a contested case hearing with the Department of Natural Resources (DNR) because the length of two of the floating piers in the marina plan that the DNR permitted Oct.
Boni Pueri, a Czech Boys Choir that awed peninsula audiences in 2004 and 2005, will be back performing in Sturgeon Bay on Monday, November 30 at the United Methodist Church at 7:30 pm. Third Avenue Playhouse (TAP) will continue its holiday series with the upcoming performances of The Best Christmas Pageant Ever and Winter Tales the first two weekends in December. To complement this year’s A Renaissance Christmas program entitled The Twelve Days of Christmas, Gary Berkenstock, the Chicago Early Music Consort’s artistic director, decided it would be fun to include a like number of instruments for these concerts. The Holiday Music Motel in Sturgeon Bay is pleased to introduce The Holiday House-Concert Series. As a part of his solo acoustic tour, Jackson Browne will kick off the series Wednesday December 9, 2009 at 7:30 pm. Birch Creek’s “Artists in the Schools” program brought jazz musicians and Birch Creek faculty members Reggie Thomas and Rick Haydon to Door County students on November 19 and 20. The Art of Music announced the schedule and performers for its seventh Winter Concert Candlelight series featuring an array of folk, blues, alternative, jazz and world music. American Folklore Theatre is excited to announce that Home for the Holidays with AFT will return to Old Gibraltar Town Hall in Fish Creek for five performances from December 29 through January 2. Lots of contemporary poems are anecdotal, a brief narration of some event, and what can make them rise above anecdote is when they manage to convey significance, often as the poem closes. February 4th, 2010 Door County, WI Richard Storm's right hand clutched at his chest just under his generous left breast – which he'd been self-conscious of his whole life. It is not uncommon in upscale magazines to come across articles about barns. A portfolio even, of barns; close-ups, nifty stone work, Dutch doors, haymows, cats, beautiful brick barns, barns painted by Rembrandt, statuesque barns that look as if they never knew a cow pie or ever had a barn cleaner extruding from their south flank. Neil Gaiman has been called the “rock star” of contemporary fiction. He plays up this “cool guy” image by appearing in black pants, black tee shirts and a black jacket – presumably leather. 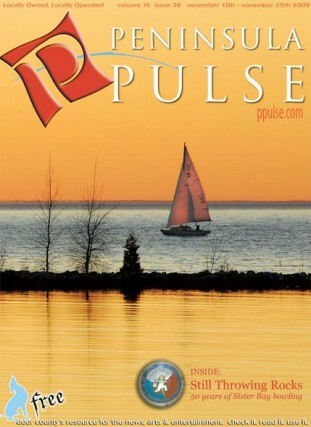 The Council for Wisconsin Writers (CWW) invites submissions of writing published in 2009 by Wisconsin authors in the following contest categories: book-length works of fiction, nonfiction, and poetry; short fiction and nonfiction; children’s literature; outdoor writing; and a set of five individual poems. Novel Ideas Bookstore in downtown Baileys Harbor will host two book signing events over the Thanksgiving holiday weekend. The out-of-state authors will stop in to sign copies of their latest books to hit the market. The Friends of Door County Libraries are hosting a Holiday Book Sale on Saturday, December 5 at the Door County Library in Sturgeon Bay. From 9:30 am – 2:30 pm volunteers will be selling books suitable for gift-giving. Phil Hansotia will read his works Dec. 9, 7 pm, at the Unitarian Universalist Fellowship’s Poetry Series in Ephraim. Hansotia was born and educated in India. Congratulations to Bernadette Strege! If you’ve ever been to Main Street Market to buy some goods You know it’s much better than foraging in the woods. Dear Mary Pat, I’ve always been into giving gifts. Big birthday gifts, little “just because gifts” and for Christmas…I was a gift giving fool. I had plans to do the same this holiday season until my hours got reduced at my job and my husband’s income slowed down to a mere trickle. Getting in touch with the kid inside isn’t always easy. There are a whole slew of stories out there dedicated to warning adults of the danger behind forgetting their inner child. Several members of Penpap – the Peninula Plein Air Painters – will be having a reception at Northern Waters Gallery in Green Bay, Wisconsin on Sunday, Dec. The Jacksonport Craft Cottage is pleased to announce the Amish Quilt Show door prize winners. Kathy and Jack Millette from Palus Heights, Il were the delighted winners of a beautiful hand quilted Amish Wall Hanging which was the door prize at the October Amish Quilt Show held at the Village Hall in Sister Bay. The work of local photographers and gallery owners Lucas and Heather Harle-Frykman is featured in the current issue of Nature Photographer Magazine. Walt Freckmann, a Door County-based artist and former executive director of the Fairfield Art Center, will unveil his first art exhibition in Sturgeon Bay on Thursday, December 3. Fine Line Designs Gallery will host their Annual Holiday Open House, Saturday, Nov. 28 from 10 am – 5 pm. Holiday drawings, ranging from $10 off up to 20 percent off anything in the gallery, will take place throughout the weekend. During the Ellison Bay Arts Holiday Open House, The Clearing Folk School’s Bookstore and Gift Shop (12171 Garrett Bay Road, Ellison Bay) will be open with special hours Friday, November 27 and Saturday, November 28 from 10 am – 5 pm. The Door County Maritime Museum (DCMM) has resurrected the Holiday Ornament Showcase, a popular holiday fundraising event that is certain to brighten the homes of those fortunate enough to win one or more of the ornaments or artwork. After a month of successful spelling bee contests in November, The Cookery's weekly spelling bee will continue into December. Spelling bee competitions will now be held on Saturday nights starting December 5 and run through January 2. The Clearing Folk School in Ellison Bay will be hosting a special holiday tradition, The Clearing’s Annual Christmas Open House, from 10 am – 4 pm Thursday and Friday, December 3 and 4. As soon as the turkey and stuffing are consumed, multiple football games watched, and the hunters back in the woods, Sister Bay will turn to holiday festivities on Thanksgiving weekend with Capture the Spirit. • Sturgeon Bay Schools has once again been the recipient of a Kohl Breakfast Start-up Grant to help offset the costs of running a breakfast program, this time for Sunset School Kindergartners. Help Sister Bay Trading fill their sleigh full of non-perishable food items to donate to Feed My People of Door County. Donations may be dropped off at Sister Bay Trading's showroom located just south of downtown Sister Bay on Highway 42. The Historic Naval Ships Association has presented its Ship Maintenance, Preservation, Exhibition Award to Bob Perlewitz for his work and leadership in the restoration of the Tug John Purves, now moored at the Door County Maritime Museum in Sturgeon Bay. Hello everyone, my name is Doobie. I am a neutered, black and tan Miniature Pincher Mix. My birthday is March 29, 2009; I’m still a young boy and ready to play! I am a little shy around strangers so when you come to visits please go slow with me. Ever since I began learning to be a teacher in 1949, I’ve had the nagging compulsion to want to know the name of every plant, animal, bird, insect, stone, fossil, etc. “Selling Christmas trees,” Herb Ottman exclaimed, “is a disease!” “It’s like being on drugs,” his son Steve said. “Once you start, you can’t stop!” Steve’s brother Ken laughed and nodded, but then added, “It’s a family tradition. Alcoholics Anonymous & Al-Anon 800.746.0901 or 920.746.0900 www.aadoorcounty.org The local chapter offers 20 meetings throughout the week at various times and locations throughout Door & Kewaunee Counties. GIBRALTAR VARSITY ATHLETICS • Boys Basketball Dec. 4, vs. Oconto, 7:30 pm Dec. 11, vs. Sevastopol, 7:30 pm • Girls Basketball Nov. 27, Viking Invitational, 7 pm Dec.
8,200 Number of cash for clunkers swaps that involved Ford F150 pickup owners who swapped for new Ford F150s, the most common swap in the program 1 Mile per gallon fuel efficiency improvement over the old truck in such swaps $562,500 Amount spent in the program for vehicles that got worse or the same mileage as the trade-in 95,000 Number of new vehicles purchased through the program that got less than 20 miles per gallon 21 Miles per gallon achieved by the Model T Ford 15. “There are a lot of kids these days who don’t even know what a clothespin is. They think it’s a potato chip clip.” Alexander Lee, a lawyer in Concord, N.
1. Set your computer’s operating system to power down or go into sleep mode when not in use. A monitor in sleep mode can consume less than 10 percent of full operating energy. Door County's Renewable Energy Task Force (RETF) is updating what will be the third-edition of its Door County Renewable Energy Resource Guide. They are seeking new and additional listings in the directory of both users and vendors of renewable energy (RE) technology in Door County. Cell phones have made one of the quickest transitions from luxury to necessity of any product in consumer history. With the now indispensible (for most) gadgets has come a craving for the latest and greatest that has people turning them over astoundingly quickly. that some people place conditions on their willingness and desire to give to others in need? “Why Is It…?” was designed by Dr. Steiner to address readers’ questions about human behavior from a social psychological perspective in order to inform and stimulate dialogue about the ways in which our thoughts, feelings and behaviors are influenced by the presence of other people. • Tomatoes have a remarkable history. They apparently originated in the Andes Mountains, made their way north to Mexico, and were discovered by Spanish explorers who sent seeds back to Europe. Welcome to the Notes from the Grove providing Liberty Grove residents and visitors tidbits of information about goings on in town government. • The town board unanimously approved the proposed 2010 Budget on Monday, Nov. I confess that I am a numbers and statistics junky. Throughout the years countless columns have been dedicated to this subject and though I occasionally feel like I am inflicting my obsession on you, I still believe there are fascinating things to be learned from all this data – particularly about our peninsula and Wisconsin. • Glas, the green coffeehouse, will extend its hours throughout the month of December to accommodate holiday shoppers. Week day hours for December will now be 7 am – 7 pm. Door County Supervisor Marc Savard (District 20) announced that he will not run for re-election in 2010. Savard, who was first elected in 2000, will devote his time to his campaign for the Republican nomination in the 8th Congressional District race. While the city’s Holiday Tree Lighting Ceremony took place Friday, November 20, plenty of holiday activities will still abound in Sturgeon Bay in the upcoming weeks. Take a break from the chaos of Christmas and spend a couple hours relaxing in the natural atmosphere of The Ridges Sanctuary’s Natural Christmas event on December 12 from 3 – 6 pm at the Marshall cabin. With an expected spike in the popularity of the Jacksonport Polar Bear Plunge after its starring role in the film Feed the Fish, event organizers are prepping for the 24th annual plunge scheduled for January 1, 2010. On Thanksgiving weekend, November 27 and 28, everyone is encouraged to get into the holiday spirit by taking the fourth Annual Holiday Home Tour for the Northern Door Children’s Center. Jacksonport’s Annual Thanksgiving Day Parade and Fund Raiser, now entering its 13th year, will kick off at noon from the Jacksonport Fire Department. The parade starts at the fire station, takes a right on Highway 57 to Mike’s Port Pub where it turns around and heads down to the Square Rigger and then finally ends up at J. Great Northern by Design at the Settlement Shops in Fish Creek will host a Happy Holidays Open House on Saturday, December 5 from 10 am – 5 pm. Along with lots of great gifts and home accessories, handmade Christmas wreaths by Robbens Nest Farms, made of locally harvested fresh greens, will be for sale to add holiday cheer to any home. Egg Harbor will be celebrating Holly Days, an ol’ time Christmas celebration, the Friday and Saturday after Thanksgiving. The family friendly festivities start on Friday, Nov. The Ephraim Business Council invites everyone to celebrate the season at Ephraim’s annual Christmas in the Village event on Saturday, December 5. With activities planned throughout the day, Christmas in the Village promises to be holiday fun for the whole family. The Women’s and Children’s Health Center at Door County Memorial Hospital is announcing another group of Art for Health workshops for children beginning in January. Although the Collins Learning Center at Crossroads at Big Creek will be closed on Thanksgiving Day so that staff can enjoy their holiday dinner with family, the learning will continue just after the food and festivity is wrapped up. Christmas carols sung around the vintage pump organ will highlight the annual holiday gathering of the Sister Bay Historical Society on Friday evening, December 4. The Door County Maritime Museum and the Family Centers of Door County are offering a chance for families to tour the peninsula's finest museum for free Sunday afternoon. Fifty years ago, the late Earl “The Pearl” Willems decided that folks in Sister Bay needed a winter attraction, so he spent $75,000 converting a dance hall into a bowling alley. It was recently my pleasure to receive notification that a poem by Estella Lauter has tied for first place in the adult division of the Barbara Mandigo Kelly Peace Poetry Contest conducted by the Nuclear Age Peace Foundation (NAPF). There are lots of poems in which a poet expresses belated appreciation for a parent, and if you don’t know Robert Hayden’s poem, “Those Winter Sundays,” you ought to look it up sometime.